Consider yourselves lucky if you are a part of India’s first planned city post-Independence! 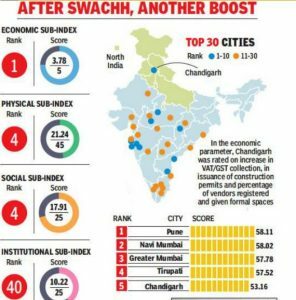 In the economic parameter, Chandigarh was ranked first in the country with a score of 3.78 out of 5 as there has been a vital increase in VAT/GST collection; percentage of vendors registered and an increase in issuance of construction permits and provided formal spaces. Coming to the physical and social parameters, the city secured the fourth rank in the country with a score of 21.24 out of 45 and 17.91 out of 25, respectively. In the social parameter, which comprises of four indicators, the city scored 3.6 out of 6.25 in safety and security. which seems to be quite less due to the recent spurt in crime. In the health aspects, the city scored 5.6 of 6.25. Chandigarh is known for having advanced medical facilities which cater to the needs of the residents of the city as well as of the neighboring states. Although we have made our Chandigarh city reach such an eminent rank, there is a lot to be done to secure the first position. And this responsibility is not just for the administration but for the people of Chandigarh too.